My proprietary diagnostic and therapeutic approach leaves no stone unturned when it comes to helping my patients find relief for peripheral neuropathy symptoms. Using a combination of functional medicine, functional neurology and integrative medicine, my clinically proven “neuropathy recovery program” has helped even the most chronic peripheral neuropathy sufferer. Did You Know That MOST Peripheral Neuropathy Treatments Simply Cover Up The Symptoms While Your Body Continues To Destroy Your Nerves? Peripheral neuropathy describes damage to the peripheral nervous system, the vast communications network that transmits information from the brain and spinal cord (the central nervous system) to every other part of the body. Peripheral nerves also send sensory information back to the brain and spinal cord, such as a message that the feet are cold or a finger is burned. Damage to the peripheral nervous system interferes with these vital connections. Like poor connection to a cell phone tower, peripheral neuropathy distorts and sometimes interrupts messages between the brain and the rest of the body. The most common peripheral neuropathy symptoms patients suffer from are: chronic tingling, numbness, weakness, or burning pain. They often find it difficult to walk, sense if they are going down stairs properly, know if they have injured the affected area and generally are miserable because of the chronic pain they often experience. I take a comprehensive approach to helping my patients with peripheral neuropathy. Not only do I work on the local area affected by using cutting edge therapy, addressing metabolic conditions (such as blood sugar problems) but I also treat areas in the brain responsible to receiving these messages from the body. It is common that peripheral nerve damage will lead to functional changes in the brain! You MUST address all areas in order to get the BEST OUTCOMES. There is a ‘road map’ in the brain of your entire body. Every body area (foot, hand, face, etc.) is represented in a part of the brain called the parietal lobe. If poor nerve signals come into the brain because of peripheral neuropathy, this can lead to problems in the brain itself. Although you might start out with peripheral neuropathy, the longer you have this condition the more likely you’ll experience issues higher up into areas of the brain. That is why damage to the peripheral nerves is just part of the story...and why providing the right type of care to the local area, such as your feet or hands, can lead to discouraging short-term results. Loss of balance and injuries related to poor balance are a serious concern. Hip fractures, broken arms and concussions can all occur because of poor balance related to loss of foot sensation. A study by Richardson et. al. found diabetics with EMG-confirmed peripheral neuropathy were 23 times more likely to report instability resulting in a fall or injury. It’s important to recognize this very real danger and work toward prevention. My program incorporates fall prevention activities. I also know that recovery from peripheral neuropathy is very real, very possible! I can almost bet that you’ve never been told that. Have you? Most patients just the option to take a pill for pain relief. Doctors usually tell patients that the damage is permanent. Most patients give up at this point and never find the treatment options that will allow them to actually heal their damaged nerves. I’ve made it my life’s work to stay on the cutting edge of non-surgical procedures and specialized treatment technologies…dedicated to helping sufferers of numbness, tingling, burning and sharp pain caused by nerve related conditions. Patients that have been discouraged and frustrated by conventional medical care and left taking medications that do nothing but cover up the symptoms and don’t address the underlying cause of the condition. Neuropathy is a complex condition and it takes a Big-Picture approach that utilizes the best science and technology have to offer to manage it effectively and create the relief I am sure you desire. 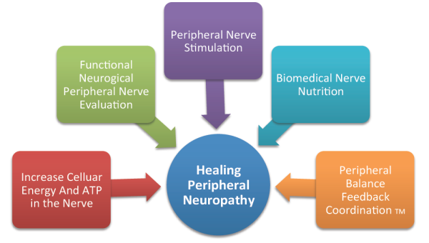 I attack the cause(s) of peripheral neuropathy from every angle, including every critical element necessary to promote healing of the nerves and blood vessels and maximum symptom relief. The success of our neuropathy care program is attributed to my unwillingness to cut corners, leveraging the latest technological advances , and developing proprietary scientific protocols that provide a predictable result. First you should know that I address each person as an individual using both metabolic and neurologic strategies. This is what I mean by “no stone is left unturned” when it comes to helping my patients. You are not looking to try an old previously unsuccessful treatment again…you want relief…you want results! At Johnson Chiropractic Neurology & Nutritiion I have combined the five key elements required to address the damaged nerves in your feet and/or hands and provide true and lasting relief. These protocols are designed to give you every chance possible to feel better. Why not restore normal nerve communication, function and health by healing from the inside out? Time is of the essence. Take action. Click on the button below to download our FREE guide to defeating neuropathy, today!